In continuation of hockey week here on TFD, we take a more in depth look at the defending Stanley Cup Champions, the Chicago Blackhawks. The Blackhawks, one of the Original 6 NHL franchises, have been a member of the league since the 1926 season. As one may assume, with such a long tenure and history in the windy city, a successful past precedes them. In their years, they have found themselves as the league champions 4 times, captured two conference championships since the league began keeping count, and an impressive 14 division championships. Enough about the team, let's get to the logo. The original incarnation of what was voted the best logo in hockey, was originally designed by the wife of the clubs first owner, Frederick McLaughlin. The drawing originally illustrated by Irene Castle was first rendered in 1926 and has had multiple drafts since day 1. The logo has inspired the creation of a team mascot named "Tommy Hawk" as a form of homage to the Native American influence in the teams name. With the roster the Blackhawks have today, along with their great tradition, and incredible fan base they are sure to take a ride on the road to success for quite some time. As they made their run to The Cup last year, homegrown youngin's Patrick Kane and Jonathan Toews helped greatly as they established their presence early and often throughout the playoffs. 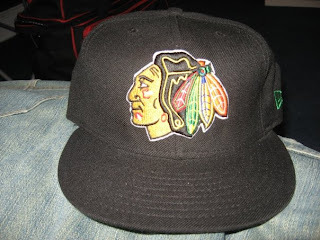 The cap featured has a black crown, black brim, and the traditional four feather Native American Blackhawk logo that we all know and love on the front. This is truly a classic logo that looks great on caps, jerseys, shirts, etc. I doubt I will ever get sick of looking at this one any time soon. You can find merch with the afore mentioned logo at the link below, now go pick up one of the greatest logos in sports!